The Secretary of State expressed his own personal concern that the actions that the theatre took regarding the UKJFF politicised long standing cultural relations. You may be aware that the Secretary of State wrote to the UKJFF to explain that he could not intervene in the matter. This was nothing to do with interfering in artistic freedoms. Both the Secretary of State and the Minister for Culture fully respect the arm’s length principle especially as it applies to freedom of expression and artistic endeavour. 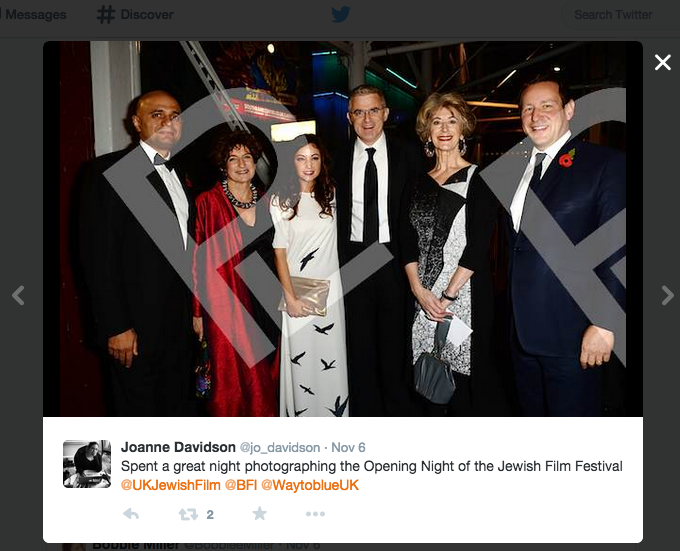 The image below was taken at the opening gala of the UK Jewish Film Festival in November; it encapsulates the relationship between the UK Department for Culture, Media and Sport, the Israeli Embassy in London, and UK Jewish Film. From left to right: Sajid Javid, UKJFF director Judy Ironside, actress Nelly Tagar, Israeli Ambassador Daniel Taub, Maureen Lipman and Minister for Culture Ed Vaizey.